Even if you have no idea what an electrical service panel is, you have probably opened the one in your house before. You may call it the fuse box, circuit interface or the metal thing that holds all of the breakers. Every residential and commercial structure with active electrical circuits has at least one of these panels. The service panel is like the brain of your electrical system. It’s the “nerve center” where the power line from outside meets with your home’s internal circuits. There are many different circuits that all come together at this panel. It’s also where power is distributed to them all separately. Each fuse or breaker on the panel represents a separate circuit that corresponds to a specific location, like a single bedroom, inside or outside the structure. When there are too many things running plugged in, the associated breaker will flip or the fuse will crack to cut off power to the overloaded circuit. It’s a little aggravating when you step out the shower, wrap yourself in a towel and plug in your hairdryer only to be left standing in total darkness. As inconvenient as it is, this mechanic ensures the safety of everyone inside the building. The wiring in your home can only handle a limited amount of energy. If it wasn’t for the panel, your electrical system would become a serious hazard whenever excessive demand was placed on a circuit. The main service panel needs to be current in order to operate safely and correctly. Unfortunately, many panels in American households are badly outdated. 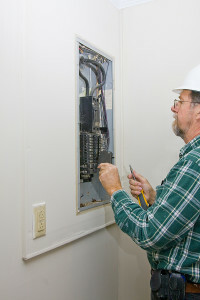 Can you remember the last time your house had an electrical panel replacement? If it’s been 10 or more years since you’ve had a service panel upgrade, ask yourself what appliances and devices you have had replaced in that time. Did you buy a new television in the last few years, or possible even more than one? What about a new computer, dishwasher or clothes dryer? Modern households are filled with power-hungry gadgets and heavy-duty machines that perform a lot of hard work for us. Appliances require a lot of energy though, so they can easily strain older electrical systems and out-of-date service panels. 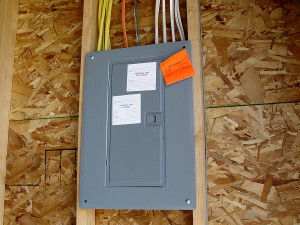 Some manufacturers recommend that you have at least a 200 amp panel before connecting their products to your home’s power. Some devices won’t operate at all without a powerful circuit interface. A problem with the panel can cut power from certain parts of your house or prevent electric energy from flowing throughout the building altogether. An electrical service panel upgrade is often the only option for solving power loss from a broken panel. In many cases, it’s impossible to restore a burned out or broken panel so that it can continue to function properly and safely. It’s illegal to install or attempt to repair a service panel without a professional license. This tiny metal box conducts incredibly strong electrical currents. You can easily incur fatal injuries by tampering with the box without the necessary tools and experience. That’s why Delaware Electrician contractors like Conductive are here to help. We upgrade electrical panels in Wilmington DE on a regular basis, so we are excited to put our expertise and skills to good use by providing you with excellent service. 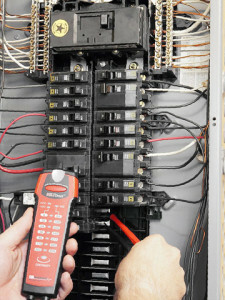 Give us a call to discuss a possible circuit panel upgrade and get an estimate for your project. You may also find current deals and coupons here that will save you tons of money on your next repair, so please take a look around!